Truly unique, truly their own. Cherry wood with a maple insert; natural satin finish. Due to the nature of wood, patterns and color will vary. Personalization is included as shown. You may choose from Times Roman Bold and/or Times Roman Bold Italic for the engraving. 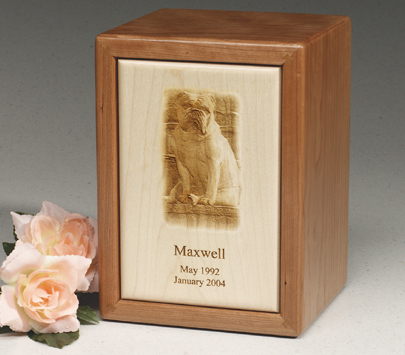 Submit via email or postal mail, 2 good quality photographs, with your first and second choice, to be laser-etched onto the urn (photo will be returned if sent via postal mail).